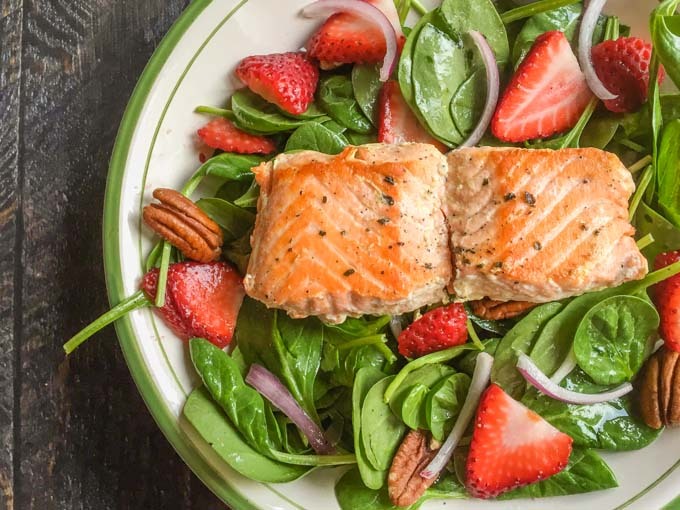 A fresh and delicious strawberry salmon salad with the sweet kick of ginger dressing. Easy to make for a healthy lunch or dinner. I have been a strawberry fanatic these days. Maybe it’s because they are in season and there always seems to be a buy one get one free bargain at the grocery stores. 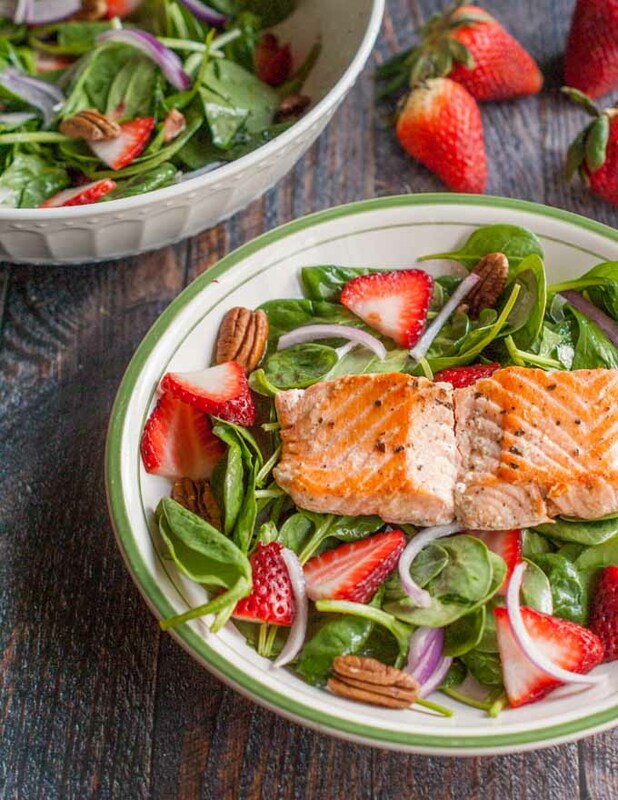 One way I really enjoy using strawberries is in salads like this strawberry salmon salad. They have such beautiful color and add a bit of sweet yet tart flavor that works well in most salads. In this salad they taste delicious with the crunchy pecans and savory salmon. 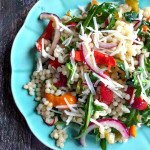 This salad will literally take only 5 minutes to make because it has simple ingredients in the salad and the dressing. The dressing is a light vinaigrette with honey and ginger, which is delicious on the salmon as well as the greens. To make the dressing, just whisk white balsamic vinegar, olive oil, honey, ginger, salt and pepper. The rest of the salad consists of greens (I used baby spinach), sliced strawberries, thinly sliced red onion and whole pecans. I personally like this combination of pecans and strawberries but you could substitute different nuts like almonds, walnuts or even use seeds (pumpkin, sunflower, etc.). Also you can add a bit of blue cheese or goat cheese to make it a little fancier if you like. So there is not much to this recipe but I thought you might like the flavor combination and I especially liked the ginger dressing. This could easily be a meal in itself or as a side dish . 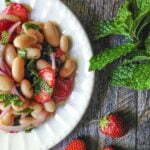 And if you too like fresh strawberries in your salad, check out my strawberry caprese salad. 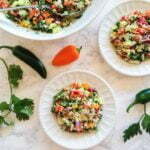 Well I hope you enjoy this healthy, flavorful salad! 572 cals / 50.7g fat / 14.4g carbs / 4.5g fiber / 18.8g protein = 9.9g net carbs. To make the dressing, add your vinegar, olive oil, honey, ginger, salt and pepper to a bowl and whisk until blended. In a large bowl add your greens, onions, strawberries and pecans and then add the dressing. Start with half of the dressing and add more as your like. Plate the salad and place a cooked salmon filet on top. Previous Post: « Low Carb Breakfast Pizza – eat for breakfast, lunch or dinner! The calorie count is wayyyyyyyy off on this! Hi Linda, I did recalculate the recipe and I see I left out the red onion. However the calorie count was not much different. I’ve fixed it on the post so thank you for bringing that to my attention. I use an app called Lose It to calculate all my recipes and keep them consistent. I’ve noticed over the years that different calculators have different information and most have entries that are incorrect due to the fact that people enter in their own information and it is shared with the apps database. So if I input incorrect information for salmon, everyone who uses that app could be using the incorrect information. For that reason I try my hardest to find the most accurate entries. But I make mistakes so if you can explain to me what is off, I’d appreciate it so I can fix it. Is it too high in calories or too low? Looking it over the dressing is the biggest source of calories and realistically no one would use the whole recipe for their salad so that would cut down on the calories a lot right there. Also the pecans are fairly high in calories and cutting down on them would cut calories as well. Thanks again for letting me know about this! 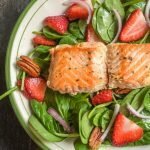 I love using strawberries in salads, and am a huge salmon fan, so this is right up my alley, the ginger dressing sounds like the perfect accompaniment, yum! Thanks Joy! I really liked it. 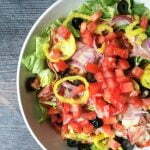 You have literally used my favorites all in one delicious salad! Well they are mine too! Thanks for stopping by Michaela. That is right up my alley. I love the dressing recipe. 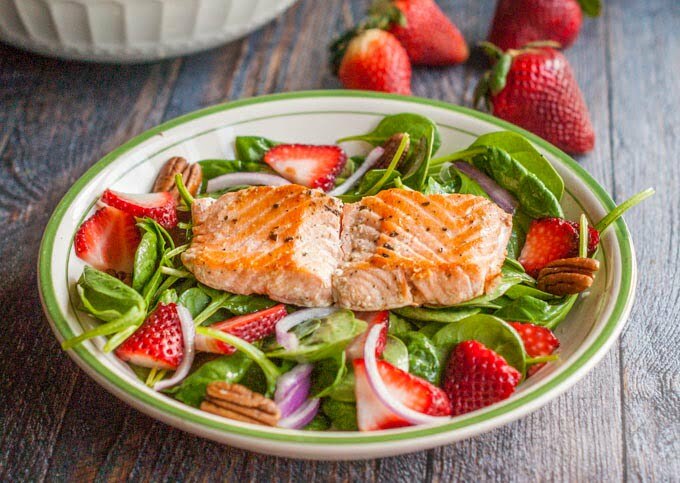 I love salmon, I love strawberries – so this will definitely be a winner!! Why thank you Diane! I hope you like it. So not a salmon fan, but love the salad all alone. Maybe one day I will learn to like fish. I’m going to have to quit with the salmon posts Kristen! But I do think you will like the rest of the salad.